DutzWorks - Illustration and Graphic Design by Derrick Utz: Finally! Indie-Man's Toolkit Volume 1 Available!! Finally! 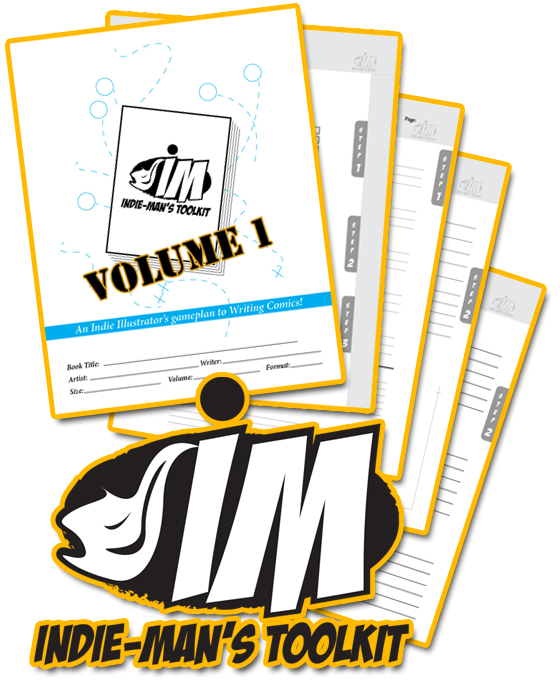 Indie-Man's Toolkit Volume 1 Available!! Avast, me Hearty's!!! I hope you all are doing well and are seizing (and ruling!) your own creative adventures! At last I have gotten to a point that I can post the booklet for its first volume's download! What is it? This is a "toolkit" I started building a few months ago with the help of some other indie creators I know and have worked with. I still have more information to add and I still have books about creating, structuring and writing stories that I will be reading soon so I will update it at a later date. I just needed to get this part of it off my desk and out to you all so I can concentrate on "Bot's Amusement Park" and my design briefs that were mentioned in the last post here. This kit's main purpose is to help illustrators with that all elusive task of story writing and structure. Since i often create instruction sheets for work, I decided to create a set of forms and fill-in-the-blank questions for myself that would help guide me to asking the right questions and structuring the answers. This is what eventually became the Indie-Man's Toolkit! Below is the list of the artists that helped me on this round and I will update the list when I get Volume 2 finished in the future. All right everyone!! I have made a special page on my site to download the Indi-Man's Toolkit! It is totally free and is just to help you all with your creative processes! The special page is just to help me count the visits and downloads so I can use them to build better material. Click the link below and get to creating!!!!! Thank you all so very much for being here and for joining me in all of these creative adventures! Please let me know if you have any questions about the kit or from me. Please come back and tell me how you used it and if it was helpful to you! Click here and go to the Toolkit Page!! !